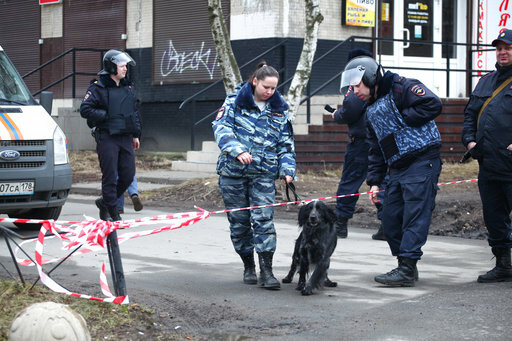 ST. PETERSBURG, Russia (AP) — Russian security agents on Thursday arrested three people suspected of links to a suicide bomber accused of attacking the city’s subway and deactivated an explosive device in the apartment where the suspects lived. The Investigative Committee said the suspects are residents of the former Soviet Central Asia region like the bomber, 22-year-old Akbarzhon Dzhalilov, a native of Kyrgyzstan. Dzhalilov blew himself up on a busy subway line Monday, killing himself and 13 others and wounding over 50 people. The impoverished, predominantly Muslim countries in Central Asia are seen as fertile ground for Islamic extremists, and thousands of their citizens are believed to have joined the Islamic State group in Syria and Iraq. No one has claimed responsibility for Monday’s subway bombing, but Russian trains and planes long have been targeted by bombings by Islamist militants. The committee, the nation’s top criminal investigation agency, said investigators also found objects that would help advance the probe during a search of the home on St. Petersburg’s eastern outskirts. The Federal Security Service, the main KGB successor agency, said in a statement that its experts defused a self-made explosive device at the apartment. The Russian news reports said three people were arrested. A leading St. Petersburg news portal, Fontanka.ru, said materials used in the explosive device found Thursday matched those used by militants in Syria. An unidentified law enforcement official told the Tass news agency that investigators were checking information that Dzhalilov may have trained with IS in Syria. Russian President Vladimir Putin has said between 5,000 and 7,000 people from Russia and other former Soviet republics were fighting alongside the Islamic State group and other militants in Syria. He has named the IS threat as one of the reasons behind Russia’s military campaign in Syria in support of Syrian President Bashar Assad. Thursday’s arrests came a day after law enforcement agencies detained eight Central Asian migrants suspected of acting as recruiters for IS and al-Qaida’s Syria branch. The investigators found no immediate evidence of their involvement in the subway attack. With St. Petersburg residents tense following the deadly subway bombing, the collapse of part of apartment building on Thursday triggered fears of a new attack until city authorities explained the cause. No one was hurt. One victim of Monday’s attack, 50-year-old Irina Medyantseva, an artist well-known for the dolls she made, was buried Thursday in a funeral attended by a few dozen relatives and friends.